In today’s modern world, computers are used in every facet of life. Computers are not used because they are smarter than we humans but because computers are faster and can easily be employed in solving problems that involve task automation and timely service delivery. Computers are flexible and can be made to execute any kind of task given that an appropriate software program (and hardware) is available for such task. In the field of information management, computers have become invaluable tools for effective management of data. Huge amounts of Information data can now be accessed or archived easily and quickly using a computer system running database software. The project, which deals on information management, is a Computer/SMS based students’ fees payment system. It provides a means of remote fees payment through the use of SMS messaging. Students simply purchase scratch cards with a concealed pin code. The cost of the scratch cards covers the amount of the fees. The scratch cards can be scratched to reveal the pin code. The student can then send this pin code with some other information such as his/her registration number, department, and year – using a specific format, to a destination number. The destination number is the number of the SIM card used in the MODEM connected to a server computer running the project software. Once the MODEM receives the SMS sent by the student, the software reads this information and extracts the pin code, registration number, department and year data. The software authenticates the pin code, if the pin code is valid; the student’s payment is acknowledged and the information is then stored in a database for future reference. The software is entirely coded using Microsoft visual basic 6.0. Microsoft Access database is used as the main database engine. SMS interface is realized using a Huawei MTN USB data modem and communication with this MODEM is via AT commands. The operation of the project should not have any distance limitation (except where there is no network coverage). 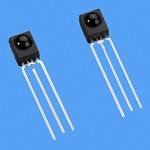 It should work as a non line-of-sight (NLOS) device. It should be compatible with a variety of mobile phones. 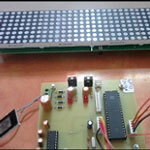 It should be able to function with any type of GSM network. The hardware part of the project is basically the MTN Huawei fastlink MODEM. The software design was developed using the basic principle of first drawing out the flow chart before writing the source code. To ensure that the memory footprint is as low as possible. To ensure a user friendly and easy-to-setup-and-use software. To reduce the number of errors to be debugged as much as possible. To simplify the codes for easy understanding for future updates. Fees (space) PIN (space) REG Number (space) Department (space) Year. 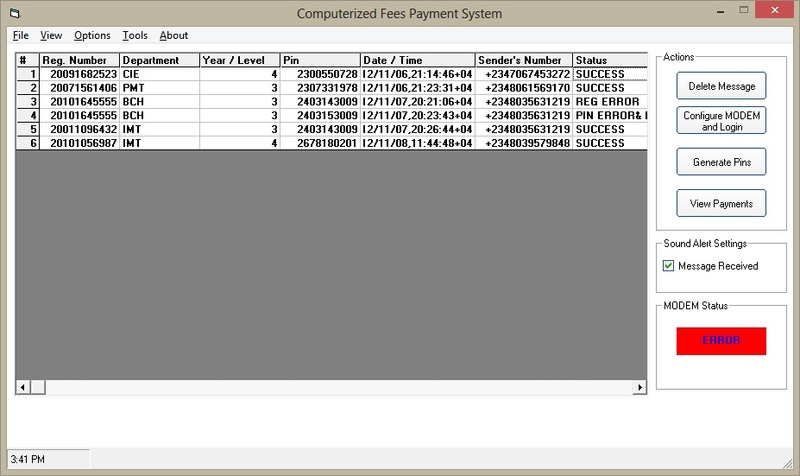 The software first checks for the word “FEES” in the message. If a message doesn’t start with the word “FEES”, the message is deleted and is not processed. If the message starts with “FEES”, the software proceeds to process the message. 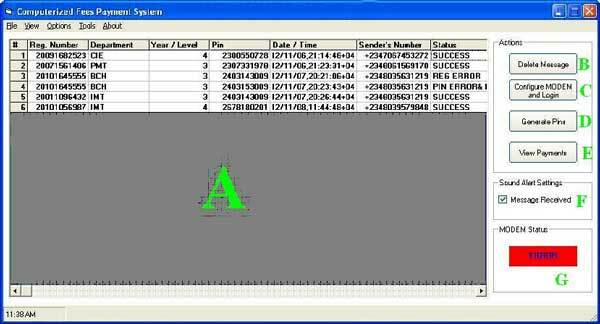 First it extracts the PIN, REG Number, Department and Year from the message and then displays this information on the data grid labeled A on the GUI (Image is shown above). This extracted information is also stored in the database. Also shown on the data grid, is the time and date the message was sent as well as the current status of the message. The status of the message tells if there was an error in the message or not. Errors in messages can arise from usage of invalid PINs, Reg number or incorrect message format. If all goes well, any received message is processed immediately and a reply message is sent to the user, acknowledging his / her fees payment. The “Delete Message” button (labeled B in the image above) can be used to delete selected received messages displayed on the data grid and also in the database. This button is active only when the MODEM check has been passed. The “Configure MODEM and Login” (Labeled C) is used to configure the MODEM and also change the administrator login username and password. Once the program is run, a login dialog box is displayed. A valid username and password must be entered to enable authorized use of the software. The default username is “admin” and the password is “me”. Clicking on the “Configure MODEM and Login” button displays the dialog box shown below. The combo box labeled “Enter Port Num” allows the user to set the communication port number of the MODEM. This port number is assigned automatically by windows when the MODEM is plugged into the computer USB port. The port number can be found under MODEM properties in device manager. 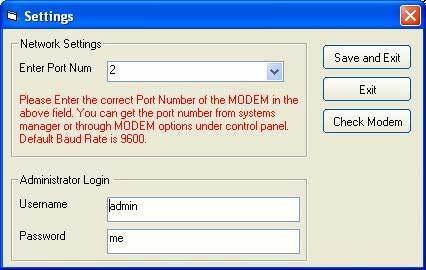 After selecting a port number, the user must click the “check MODEM” button. Clicking this button allows the software to test for the presence of the MODEM on the selected port number. If a MODEM was found, the software notifies the user through a message box; also, on the main GUI, the MODEM status (labeled G) shows “OK” instead of “Error”. Once a MODEM has been detected, the software goes into full operation; continuously polling the MODEM for new messages and processing the messages. The “Generate PINs” button, when clicked, displays the “Manage PIN Codes” Dialog. This dialog provides a means of managing PIN codes used by the fees payment service. The pin codes are ten digit numbers generated using a random number function in visual basic. Below is an image of the “Manage PIN Codes” dialog. The dialog displays the status of pins; used or unused and also the date each pin was generated. To generate new Pin code, the user must enter the number of codes to generate and then click the “generate” button. 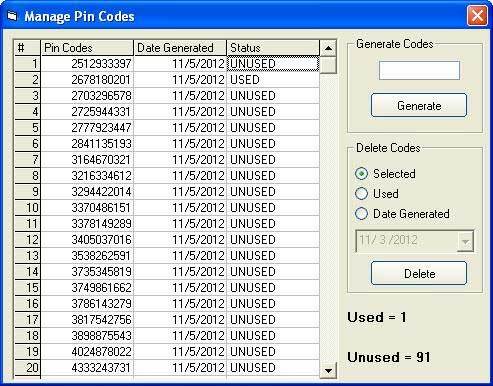 Codes can also be deleted from the database by selecting them from the data grid, by status (used) or by date generated. The “View Payments” button, when clicked, displays the “View payments” dialog. This dialog is shown in the image below. The view payments dialog displays a list of students stored in the database, whose payments where successful. Once a fees payment is successful, the software marks the pin code used for that payment as “USED”. This prevents multiple use of a pin code by several persons. At some point, the list of students can get too long that it might be difficult spotting a particular student’s information from the long list. To fix that problem, the list can be sorted using a group of options on the right side of the dialog. The list can be sorted by name, reg. number and by department. Receipts can be printed as well. To print a receipt, click on the student information from the list and then click the “print button”. A message box will be displayed to confirm. Accepting this action brings up another dialog which allows the selected payment record to be printed on the default printer assigned to the computer.